Falun Gong, also called Falun Dafa, is an ancient mind-body practice and spiritual discipline that is based on the universal principles of Truthfulness, Compassion, and Tolerance. Since its spread in China in 1992, Falun Gong has attracted about 70-100 million followers in over 100 countries. 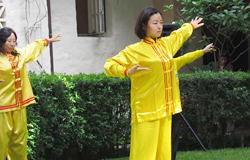 Falun Gong involves 5 sets of slow meditation exercises that help the body reach a healthier state.